Sling Shot Full Boar Sling Shot at Bodybuilding.com - Best Prices on Full Boar Sling Shot! The Full Boar’s unique design and bold color is inspired by Mark Bell’s brother and director of Bigger, STronger, Faster – Chris “The Boar” Bell. Chris’s unique mechanics and needs after a serious tricep injury required a Sling Shot® that engaged earlier and gave more support through the entire range of motion. 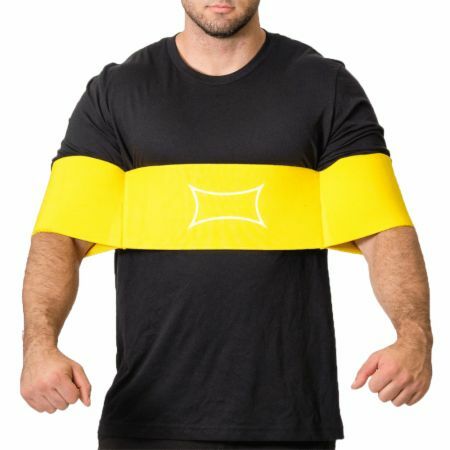 It’s made of the same material as the Original Sling Shot®, but has angled sleeves to fit larger arms. It also engages the weight sooner during the lift, giving the lifter a little more assistance than the Original model. This Sling Shot® is best for medium to heavy weights (your max plus 10-20%). Best used with loads from 315 lbs and up. Tapered sleeves for a better fit. Form fitting sleeves allows this Slingshot to be worn higher up on the arm. Single ply material but slightly stronger than the original Slingshot. Please note that if you are really tall (over 6’4”) or have especially big forearms, you need to order one size larger! At 64 yrs of age powerlifting days joined retirement. Have been thru 2 labrum/bicep tears and a spec tear to boot. I purchased this upon advice from a state bench press record holder in Fl. Shannon White....Shannon was using the sling shot for protective and rehab purposes following injury, which was exactly my need. Without resv, best rehab tool have ever used and now protect my shoulders and pecs with it. Bench stays at 315 these days which meets goals....health. Doubt gym rat101 has ever incurred an ink. Also only concerned about myself, not worrying whose cheating on the bench!! Stop cheating... lifting is not about numbers, it's about what your body can lift, not about how much your body and a piece of rubber can lift. I just got my Sling Shot this weekend. I am not a weightlifter, just an older guy trying to keep his body in shape. I only weigh 150lbs so my max bench is 200-210lbs. First time I used the Sling Shot I did 5 reps of 250. I didn't even try higher because I can't wait to see how high I can go. And it works on machine and free weights. I think this will help anybody, any size. Fellow muscleheads, I'm a 59 year old bodybuilder(Old School), been pumping iron since 1984. I started lifting when Frank Zane was popular. Over the years a right shoulder injury has deteriorated my ability to bench effectively. I bought the Full Boar this past Monday, March 13, 2017, 2-day delivery. I got the slingshot yesterday, March 16, 2017 and headed straight to the gym. I use a Smith Machine versus free weights, and loaded up two 45s, and pumped out 2-sets of 50 reps, I added a quarter, done 2-sets of 20, added a 35, done 2 sets of 20. NEVER IN MY 30+ YEARS OF TRAINING DID MY CHEST GORGE SOO MUCH WITH BLOOD! BUY THIS DEVICE IT'S FREAKING AMAZING!! By the way I'm 205 and cut to the bone!!! As advertised, this has been great help for me. I wouldn't get this one unless you're benching close to 315lbs. If you use lighter weight it's too strong, go for the original or reactive.